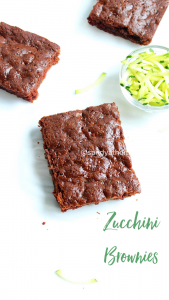 Zucchini brownies are one of the super soft, fudgy, moist and healthy brownies that taste super delish. 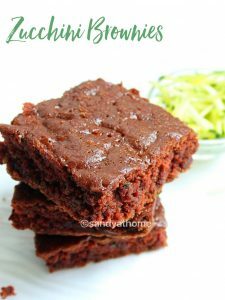 These brownies are eggless and is substituted with grated Zucchini. Sounds a little too confusing right? 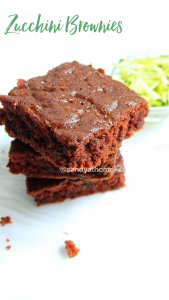 Okay it sounded the same when I watched it in a tv show but after checking on the output I.e the brownie outcome I was wowed and wanted to try it for the longest time. Every time since then whenever I go to store make sure get at least 1 Zucchini but always used it for cooking rather than baking. 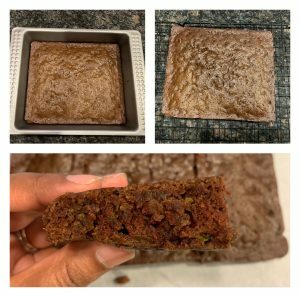 So this week I had some leftover Zucchini at home and put to use in the best possible, simple and most dreamed way, yes into brownie batter. Zucchini tastes something like cucumber not exactly but are little or slightly bitter in taste but when cooked they are yummy. 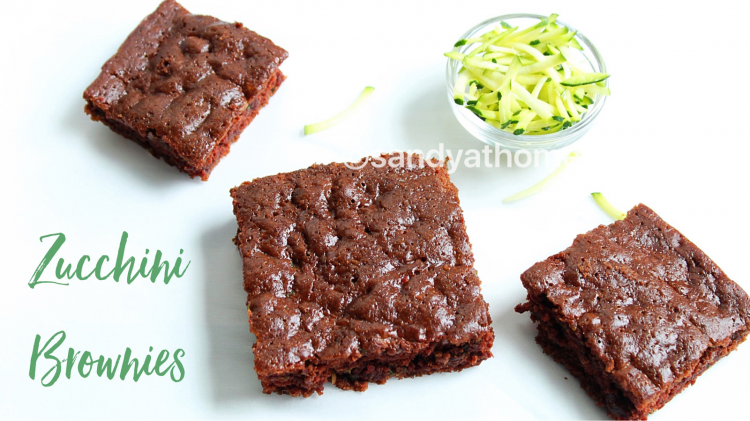 Zucchini has lot of nutritional benefits so adding it to make eggless brownies improves the taste, texture and makes the brownies healthier. Trust me even you take a bite or give it to someone for tasting they will not find out that it contains zucchini rather than me saying you will get to know when you try it at home. So lets get to the making!! Preheat the oven at 350F. 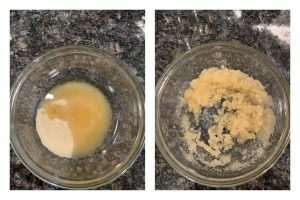 In a bowl add sugar and oil. Mix well until combined. 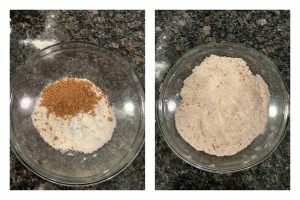 In a another wide bowl add all purpose flour, cocoa powder, baking soda and salt. Mix well. Now add sugar mixture and vanilla syrup to the flour mixture. Mix well and it should form wet sand or crumbles like mixture. 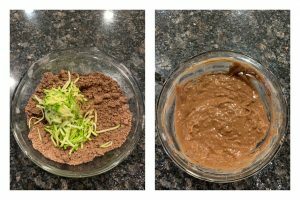 Now to this mixture add grated zucchini and mix well. Now the mixture should look like cookie dough. Now to it add water gradually to form cake batter. Grease a cake pan with few drops of oil. Now pour the batter in it and place it inside preheated oven at 350 F/ 180 C and bake for 25 minutes.. If it is not done in the prescribed time bake it for some more time. When done insert a toothpick in the centre of the cake to check if it is fully baked. 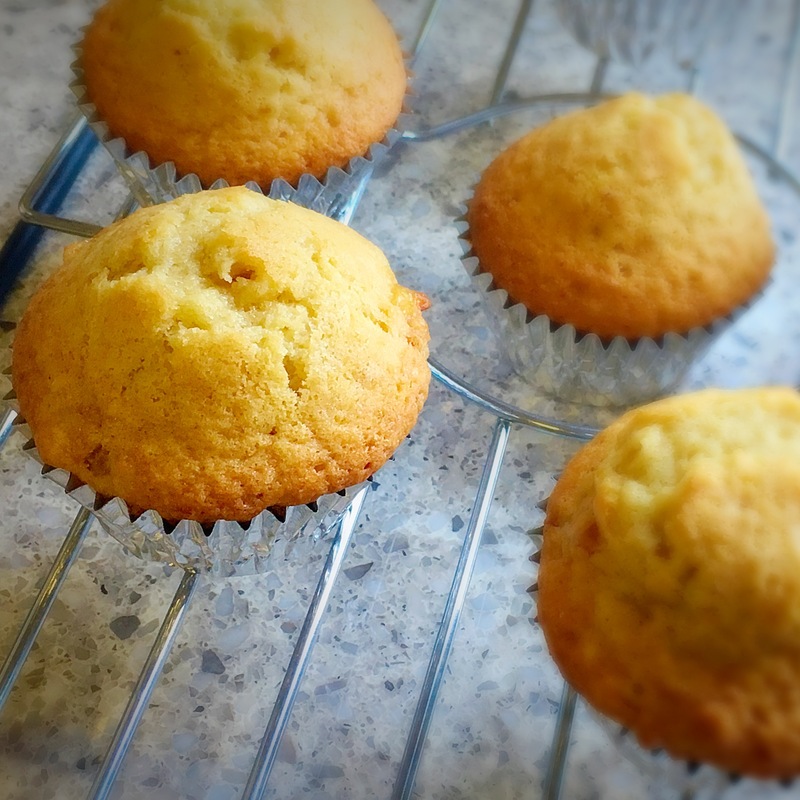 Keep it in a cooling rack and allow it cool down. Every oven is different so it can take more or less time for baking. 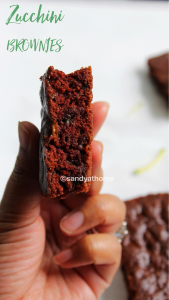 When the brownies have cooled down cut them pieces and serve it! In another wide bowl add all purpose flour, cocoa powder, baking soda and salt. Mix well. Now add sugar mixture and vanilla syrup to the flour mixture. 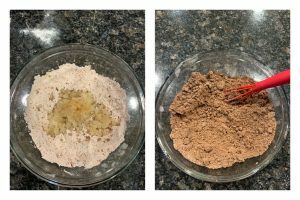 Mix well and it should form wet sand or crumbles like mixture. Now to this crumbles flour mixture add grated zucchini and mix well. Now the mixture should look like cookie dough. Now to it add water gradually to form cake batter. Grease a cake pan with few drops of oil. Now pour the batter in it and place it inside preheated oven at 350F/ 180 C and bake for 25 minutes. If it is not done in the prescribed time bake it for some more time. When done insert a toothpick in the center of the cake to check if it is fully baked. Keep it in a cooling rack and allow it cool down. 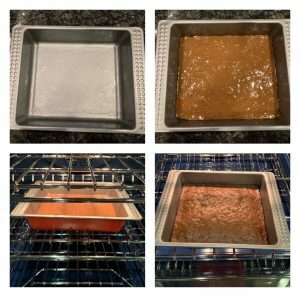 Every oven is different so it can take more or less time for baking. When the brownies have cooled down cut them pieces and serve it!